Two Seattle police officers who shot a black man in 2016 have filed a defamation lawsuit aimed at silencing socialist City Councilmember Kshama Sawant and any public figure speaking against police killings. The two officers who shot and killed Che Taylor are claiming damages because their careers were affected by Kshama’s statement that the shooting was a “brutal murder.”. Andre Taylor, Director of Not This Time, and brother of Che Taylor, posed the issue in a very different way when he spoke at the Kshama Solidarity Campaign’s initial press conference. “These officers’ feelings were hurt, and my brother’s life was taken.” The two policemen shot Che Taylor in February 2016 in Northeastern Seattle after he followed orders to get down and put his hands in the air. Attempting to play the martyr role, the two police officers had originally stated publicly that they didn’t want “one red cent of public money” out of the lawsuit. 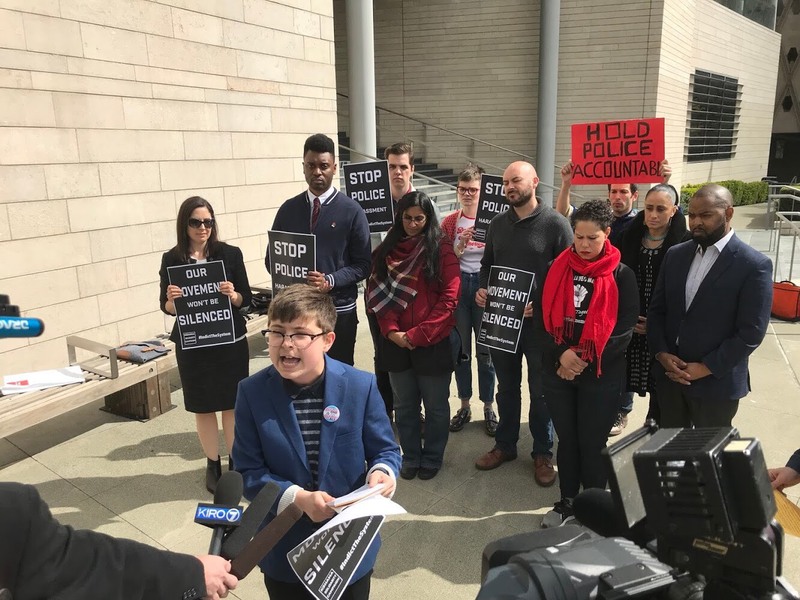 After the City of Seattle agreed, under pressure from activists, to pay Kshama’s legal costs, a judge granted the officers’ request to dismiss the original lawsuit. They have now re-filed the lawsuit, this time demanding damages be paid by the city of Seattle. Their case is on weak legal grounds, According to Emily Chiang, legal director at the ACLU of Washington, “it’s a very very high bar to prove defamation” (TheStranger.com, 8/25/2017). Proving defamation in the courts requires proving the intent of Sawant’s statement was false and intended to cause harm. With legal experts saying they have low odds to win this frivolous case, why are the officers re-filing it? The reasons are political. There is a strong movement against racism and police brutality in Seattle. The intent behind this lawsuit and the right wing forces who back it are to push back against the movement by damaging the credibility of the most prominent elected official in Seattle who takes a clear stand against police brutality. Forcing movements to spend precious dollars and time to fight lawsuits has always been among the tactics used by corporations fighting labor unions and the right-wing fighting broader progressive and radical social movements. These attacks will not silence Sawant, who has received no funding from big corporations, and will continue to speak out against police brutality and for worker rights. We need more public representatives to stand up and build movements against racism and police brutality. In a similar way we need to defend immigrants rights activists who fear arrest and deportation by ICE officials for speaking out against Trump’s anti-immigrant agenda. Many community leaders have already come out to show support and solidarity for Kshama in this lawsuit. We need to use the publicity around this lawsuit to speak out against all cases of police brutality and police killings. The launch of the Kshama Solidarity Campaign will take place on May 4 at 6pm at Washington Hall in Seattle. We will highlight the struggles of other activists who face intimidation, while preparing for the fight to defend one of the few public representatives willing to speak out so directly against police brutality. Can you help with a donation today to defend the right of everyone to speak out against racism and police violence?